Children at Hutton enjoy a wide range of musical opportunities from singing to dancing and performing at events such as Raise The Roof. Children are encouraged to create, critique, perform and discuss the music they make and listen to. The National Curriculum aims are delivered through a variety of ways including the online music program Charanga. 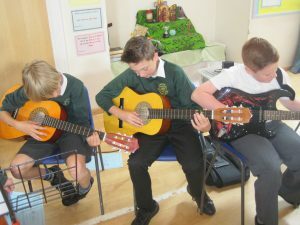 The Charanga scheme supports all the requirements of the new National Curriculum and is in line with published Ofsted guidance. 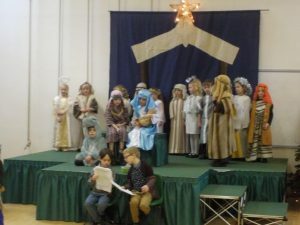 The learning within this scheme is based on: Listening and Appraising; creating and exploring; and Singing and Performing, which are all covered during each ter m.
In each year across the school, children also attend dedicated singing lessons and assemblies led by an accomplished pianist and musician. During these lessons children learn about pitch, timbre, composition and harmony. We are also very proud of the school choir for which there is high demand, especially during the festive season. We are also fortunate to be able to provide whole class African Drumming and Taiko Drumming lessons in KS2.